← Sunglasses in music Videos! Hope everyone had a fab Bonfire weekend and lots of great Fireworks were seen and lots of Hot Dogs were eaten!! I thought i would give you sneak peek behind the curtain of Oakley’s Headquarters; it’s a magical place where they come up with the most amazing Sunglasses!! Oakley headquarters is located in Foothill Ranch California! It has to be one of the strangest buildings ever seen; it almost looks like something out of a Doctor Who episode! The Lobby O Store – Beyond the front desk is the O Store. Separated by the main lobby, there are shops for men and women, each stocked with the latest Oakley eyewear, Clothing and accessories. There’s even a shop where you can create custom Oakley sunglasses and have them prepared while you wait. 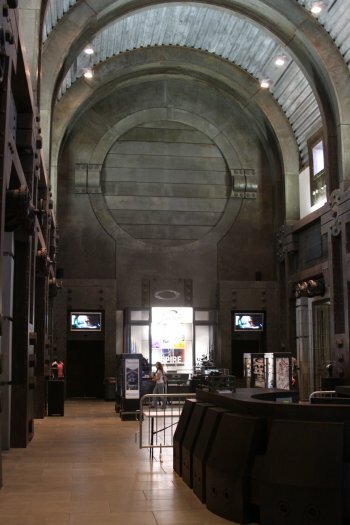 The Oakley Design Museum -Concealed deep inside the lobby store, with entrances hidden behind black curtains, a long, dimly lit hallway holds a look into Oakley’s thirty-five-year history. Beginning with the B-1 Bomber6 handlebar grip and tracing a timeline all the way to their newest product, the AirBrake snow goggle with Switchlock Technology. 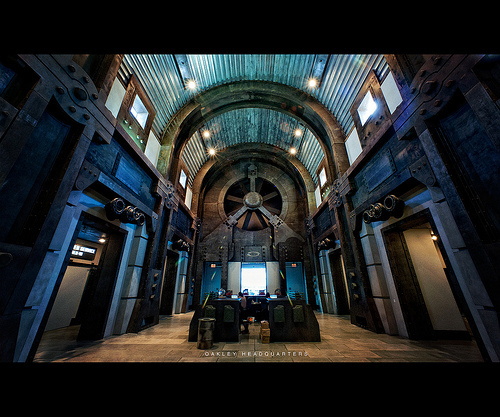 The Theater – The Oakley Theater is the most amazing image on the entire site. 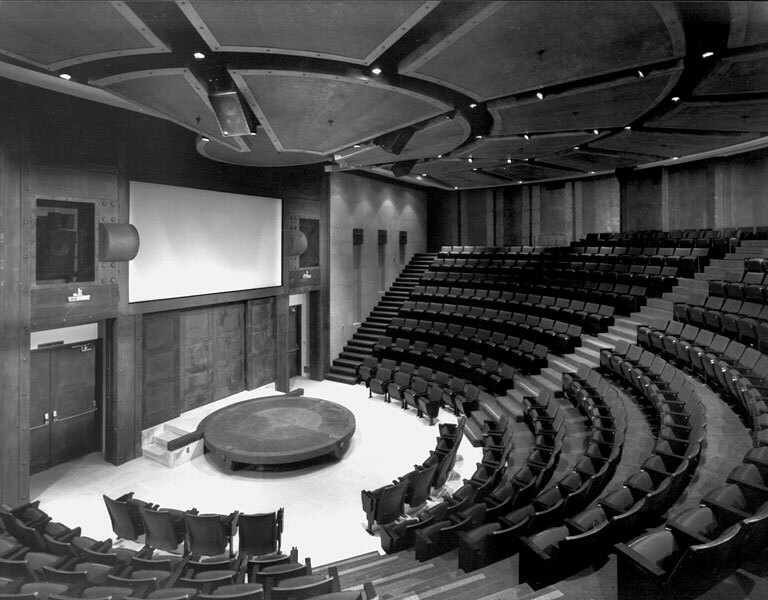 The large, 180-degree stadium chair arrangement encircles an elevated podium that looks like some enormous Frisbee. The Eco-Revolution Hub – Beyond designing products that defy reason, one of Oakley’s primary goals is to represent itself as an individual. That desire was the impetus behind Oakley’s Eco-Revolution Hub, a meeting place where Oakley employees can recycle and contribute to a charitable cause that’s close to the organization’s heart. Four large oil drums sit side-by-side at the Hub—one each for trash, recycling, eWaste, and OneSight. 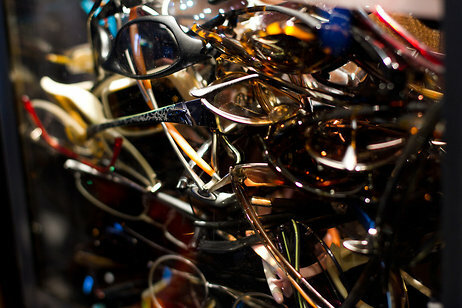 That final drum is where Oakley employees can throw in old eyewear, be it sunglasses or prescription lenses, which OneSight will eventually redistribute to some of the 284 million people worldwide who don’t have access to quality eyecare. The Design Lab -Unfortunately Oakley can’t show you the inside of the Oakley design lab; as there are too many top-secret projects to share. But what they can reveal is the stunning new graphic on the entryway to the Lab. 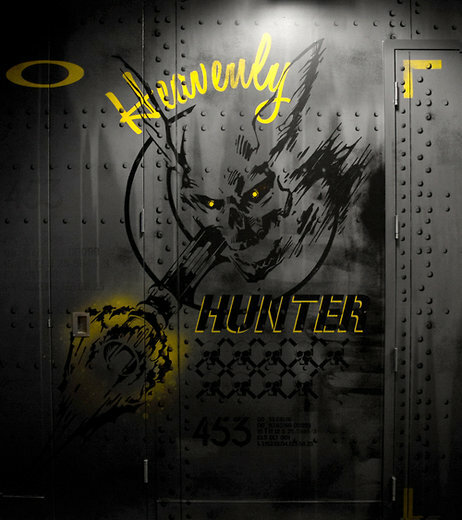 Emblazoned with the word “Hungry Hunter”, the massive wall graphic looks like the side of an airborne gunship, complete with escape hatch (which is really the department’s door). Wow what a tour!! We also have a great video for you as well which is a sneak peek at a custom Oakley printing machine that makes you a custom pair of sunglasses!! This entry was posted in Oakley HQ!, Oakley Sunglasses, Silly, Uncategorized, Videos and tagged Oakley California, Oakley Foothill Ranch, Oakley Sunglasses. Bookmark the permalink.